The Sinn Féin Ard Fheis takes place in Dublin this year at the Convention Centre. SINN FÉIN has voted in favour of overhauling its rules which deal with how the party handles internal discipline, bullying, and harassment. At this weekend’s Sinn Féin Ard Fheis, a motion was put forward to set up a new body, which will have the power to suspend or expel a party member. The investigation committee will be able to hear complaints and recommend disciplinary action. The motion states that any member disciplined shall have a right of appeal to an appeals panel. In addition, a member can be suspended by party chairs while a matter is being considered by the investigation committee. A large section of Sinn Féin’s rules on the ardcomhairle’s disciplinary powers are to be deleted and their “code of ethics” is to be now called the “charter of ethics”. The rule changes come following a tumultuous two years for the party. In February, former TD Sandra McLellan stepped down after she said the party tried to undermine her. In an interview with the Evening Echo, she said she wanted to run again but that her job became impossible because of efforts to “undermine and malign” her. “I wanted to run again but felt I could not put my family through any more,” she told the paper without referring to specifics. Last October, McLellan decided not to stand for re-election, claiming she’d been on the receiving end of bullying by members of her own party. Sinn Féin’s Cork East organisation was plunged into crisis last year over the allegations. Following an internal review in 2015, the party also expelled Kieran McCarthy. Speaking to TheJournal.ie at the time, McCarthy said the party had stabbed him in the back and offered him no explanation for its decision. Speaking at the Ard Fheis this afternoon, party chairperson Declan Carney said as the organisation grows it must ensure that ethics have “primacy at all times” in the party. 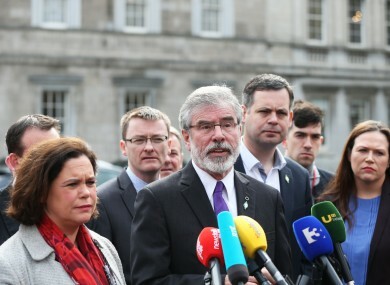 He said the new charter of ethics will set out “the standard of conduct for all members at all times within Sinn Fein”. I am asking the charter is embraced and actively supported by all party members. He said the changes represent the “modernisation of our party’s disciplinary procedures” and is a model provides the party with rules that are “fit for purpose procedures”. If party rules are broken or republican values are undermined by our members then we can employ a standardised disciplinary framework which guarantees fairness. “Sinn Fein’s greatest asset is its membership… our internal party culture should radiate and reaffirm the values,” said Carney. Follow @christinafinn8 and @TJ_Politics for updates from the Sinn Féin Ard Fheis at Dublin’s Convention Centre this weekend. Email “Change in SF disciplinary rules to give clear framework of what to do when rules are broken”. Feedback on “Change in SF disciplinary rules to give clear framework of what to do when rules are broken”.